First Week box office collection of All is Well is 21st Highest of 2015 just ahead of Dum Laga Ke Haisha and below EK Paheli leela. On Saturday All is Well grew by 28% from its Friday and is headed for a decent first weekend. The opening day of all is well was 22nd highest of 2015 just ahead of MSG messenger of god. 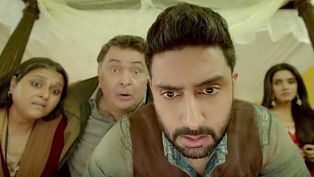 All is well is Abhishek Bachchan’s 5th highest opening day as a solo hero his highest being 2010’s raavan at 5.81 Crore. This number is just about ok considering the cost and scale of the release of movie..
All is Well was riding more on the songs than on Abhishek Bachchan as the movie was promoted on songs as it is with all T series movies. All is well released in 1579 screens Pan India. All is well is made on a Budget of 36 Crores. Production Cost is 26 Crores and prints and advertising costs 10 crore.